For commonly used decks, see Common deck types. A deck is a collection of exactly 30 cards assembled before a match, as well as the zone which players draw cards from (and sometimes add cards to) during gameplay. Each deck is tied to a specific class. Decks can be created and modified through the Collection manager. Each deck occupies a deck slot, with the number of deck slots limiting how many decks the player can possess. Players start with basic decks, but can customise or replace these. Deck Recipes provide convenient deck lists for exploring new classes or deck types. Deck Sharing is a feature which allows players to easily share and assemble each others' decks. During a game, the deck of remaining undrawn cards is displayed on the right side of the battlefield for both players. All card draw and some discard effects cause cards to be removed from the player's deck, and when a player has exhausted their deck, they will begin to suffer fatigue damage. Shuffle into deck effects, on the other hand, can add cards to the deck, including cards that were not originally part of the deck. Players can mouse over each deck to see how many cards remain therein. Some card effects interact with the deck by shuffling cards into it, copying or moving cards from it, or checking it for duplicate cards. A very few cards have special effects that can activate even when the card itself is still inside the deck. Each player deck is built for a specific class, and must only use neutral cards and cards specific to the corresponding class. For example a rogue deck could include Backstab and Earthen Ring Farseer, but could not include Fireball or Voidwalker. Class must be chosen before constructing a deck. All playable decks must also include precisely 30 cards. In Play mode, Friendly Challenge and most Adventure mode play, the player must build their deck with cards from their collection (or use a basic deck). The deck can only include 2 of each card (including regular and golden versions), and only 1 of each Legendary card. Play mode and Friendly Challenges decks must conform to the selected game format, either Standard or Wild. In the Arena, the player draws a random selection of cards out of those in Standard format, with no relation to which cards they have collected. Arena decks also do not have any limits on how many copies of the same card can the player have in their deck. A fresh Arena deck is made at the start of each Arena run, and is lost at the end of that run. Tavern Brawls may feature pre-made or custom decks. Custom Tavern Brawl decks usually follow the same construction rules as Wild format Play mode, but sometimes feature special rules or restrictions on which cards can be included. Custom decks for Tavern Brawls are created especially for that Brawl, and similar to Arena decks, are lost when the Brawl closes. Pre-made decks may be fixed, or randomly generated before each game, but either way cannot be edited or directly viewed by players. Pre-made decks may contain cards completely different from those available in normal play. A few Adventure boss encounters give the player pre-made decks filled with special cards, but this is far rarer than in Tavern Brawl mode. Adventure Class Challenges feature pre-made decks, each tailored for the matching encounter. Like Arena decks, these decks do not have any card copy limits, and like pre-made Tavern Brawl decks, cannot be edited or viewed directly. Bosses use unique decks, often including special cards which are not available to players. These decks have no card copy limits, and unlike playable decks may include cards from multiple classes and feature more than 30 cards in total. Most bosses have two decks, one for Normal mode and one for Heroic mode, with the latter usually presenting a tougher take on the same design. Each version of a boss uses the same deck each time they are played against. The following cards have specific synergy with the cards in the player's deck. While decks can normally only contain 30 cards, within a match shuffle into deck effects can introduce new cards into a deck, allowing it to exceed the normal 30 card limit, up to a maximum of 60. Any such adjustments to decks during battle are not carried beyond the match. In Adventures, some Bosses may have a deck size that deviates from 30 cards. Notably, Coren Direbrew has a deck size of 36 on Heroic difficulty and Patchwerk has a deck size of 0 on both difficulties. Each player's deck is randomly ordered or 'shuffled' at the start of the match prior to the mulligan, and then again following the mulligan if any cards were replaced. Shuffle into deck effects obviously re-shuffle the deck as well. The order of the undrawn deck is believed to be functionally insignificant, since it is not possible for the player to see the order of cards in their deck without drawing them. Those effects which draw directly from the player's deck do so randomly and thus are not affected by the order of cards within the deck. Shuffling the deck, such as through shuffle into deck effects, should therefore have no practical impact on gameplay, aside from allowing for the random placement of new cards. Players who have mastered the basics of the game are generally recommended to try their hand at constructing their own decks. This not only helps players to learn about the game's deeper strategic elements, but is likely to provide a superior deck to the basic decks available. Players can use their favourite cards from that class' basic deck (or the entire deck) as a starting point for building their new deck. Many players also choose to search for deck listings online. Players are free to change their deck as often as they wish. Decks can be created and altered through the My Collection screen. Players can have up to 18 custom decks at any time, and can also name their decks. Creating a custom deck is highly recommended, due to the generally poor nature of the basic decks. Deck construction is a key strategic element to the game. There are many broad styles of deck, with an almost uncountable number of possible variations. Common deck types include control decks, aggro decks and mid-game decks, although many decks combine elements of each of these styles. The selection of class allows for additional customization, with certain classes having a natural synergy with certain types of deck. Many players choose to create different decks in order to try out certain builds or to play against specific weaknesses or strengths of other decks. Perhaps the most critical feature of deck construction is their size limit: 30 cards. This forces players to choose between dozens of desirable possibilities, and focus upon their chosen strategy. However, the limit to the deck's size also ensures a limit to the unpredictability of the deck when playing. Paying attention to the mana curve can help in building a balanced deck. The maximum deck size was limited around April 2015 to 60 cards. Prior to this, numbers as large as 466 had been observed, using shuffle into deck effects. ↑ Blizzard Entertainment (2017-05-16). New Features Coming to Hearthstone!. ↑ Ben Brode on Twitter. (2015-01-20). ↑ Ben Brode on Twitter. (2016-01-20). 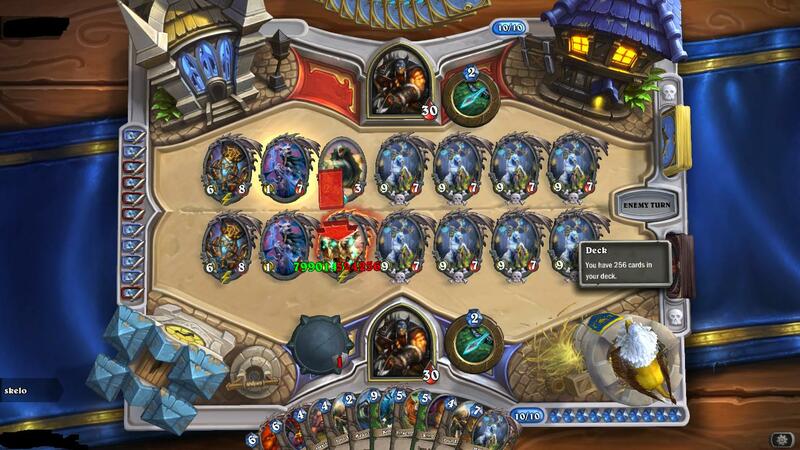 ↑ Ben Brode on Twitter. (2016-01-25). ↑ Ben Brode on Twitter. (2016-01-19).